While most people remember David Bowie as a singer, my most vivid memory of him will always be as Jareth, the Goblin King, in the Jim Henson film, Labyrinth. Thinking about Bowie prompted me to re-watch the film and remind myself of the story. Briefly, Sarah (played by Jennifer Connolly as a young teen) is stuck looking after her annoying little baby brother, Toby. In a moment of pique, Sarah wishes that the goblins would come and take Toby away–which they do. Sarah then has to find her way through the magical maze (the labyrinth of the title) and confront the Goblin King before the clock strikes thirteen or else Toby will remain a goblin forever. At the time the film came out (1986, I believe), it was not as well received as Henson’s earlier film, The Dark Crystal. 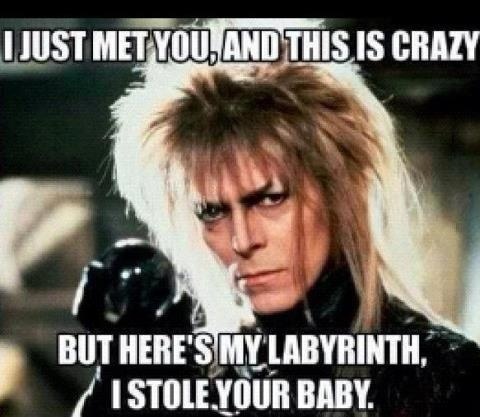 Labyrinth just didn’t work as well as the former for reasons I couldn’t articulate at the time. Re-watching the film thirty years later, the flaws are still there. The charisma of the two main leads (Bowie and Connolly), Henson’s puppet creations, and the fairy tale tropes just can’t make up for a flabby story that lacks interest and suspense. I think that the movie would have been better if it had spent a little more time on Sarah’s relationship with her father and stepmother, building up the strained family dynamic that kicks off Toby’s kidnapping. The Goblin King’s relationship with his subjects isn’t clear either. The only character who really shows him any deference is Hoggle; the others seem only nominally under his control. And why exactly does the King need to kidnap human children for his court? What strikes me particularly, watching the show again, is how it teaches young women the most important lesson of all: how to avoid bad relationships. Henson and his fellow producers were all fathers although only George Lucas and Jim himself had daughters (Brian Froud had a son). In a patriarchy, the most dangerous thing a young woman can encounter is another man and Jareth is every father’s worst nightmare–a seductive bad boy who leads an innocent girl down the garden (goblin) path. From the moment, he appears Dracula-like in Toby’s bedroom to when he dances with her at the ball to his final scene when he (in classic abuser fashion) blames the whole situation on her, Jareth embodies both the attraction and the danger of bad relationships. “Just fear me, love me, do as I say, and I will be your slave,” he tells Sarah. Of course, if Sarah were to actually do all those things, she would be his slave, not the other way round. Sarah finally shuts Jareth down with the words that end the spell: “Through dangers untold and hardships unnumbered, I have fought my way here to the castle beyond the goblin city for my will is as strong as yours and my kingdom is as great. You have no power over me.” At that moment, Sarah declares herself the equal of the Goblin King (and by extension, of any man) and asserts her determination to control her own destiny. So I was in the grocery store, post-holidays, when I came across the strangest batch of candies I had ever seen. It was a box of chocolates in the shape of mice, their tails curled so you could hang them from your tree. Around Christmas time, you become accustomed to any number of festive chocolate shapes–Santas, snowmen, etc.–but this was the first time I had ever seen rodent-shaped ones. Is this a holiday tradition I’m not aware of or are chocolatiers running out of animal shapes for their holiday creations? Regardless, I can report that the chocolates were excellent, if somewhat off-putting.